Cho U Wins Crucial Game In Meijin League: Thanks to defeating his most formidable opponent, Cho U 9P (right) is a lot closer to ecoming the challenger for the 38th Meijin title. In a game played on June 1, Cho (taking black) defeated Iyama Yuta Honinbo by resignation, improving his record to 6-0 and keeping the sole lead. Iyama had been one of just two players with only one loss, but, with his score now 5-2, the best he can hope for is a tie for first, but that will happen only if Cho loses both his remaining games; his opponents are Takao Shinji 9P and Kono Rin 9P. The other player with one loss is Hane Naoki 9P, who is on 4-1; he has already played Cho, so he has to rely on the above-mentioned pair for help in catching up. Incidentally, Saturday games are quite unusual, but Iyama is extremely busy, what with Honinbo games in successive weeks. 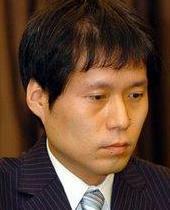 On June 6, Sakai Hideyuki 8P (B) defeated Yuki Satoshi Judan by resignation. This was Sakai’s first win in the league, to six losses, while Yuki still has not opened his account. He is now 0-6 and has suffered a dismal 16 losses in a row, spread over three Meijin leagues. Takao Takes Lead In Honinbo Title Match: All the momentum now seems to be with Takao Shinji 9P (left) in the 68th Honinbo title match. In the third game, played in the Hokkaido city of Kushiro on June 5 & 6, he defeated the defending champion Iyama Yuta and took a 2-1 lead. Playing black, Takao forced a resignation after 167 moves. In its report, Go Weekly was unable to specify a losing move for Iyama; he apparently played no dubious moves after the opening, so Takao must have gained an advantage in the first fight of the game, in which he sacrificed corner stones to set up a squeeze on the outside. Iyama has now lost three important games on the trot; the fourth Honinbo game, scheduled for June 17 & 18, will be a crucial one for his title defense. Kono To Challenge Iyama For Gosei Title: In the final of the 38th Gosei tournament, Kono Rin 9P (B) defeated Matsumoto Takehisa 7P by 1.5 points, so he will challenge Iyama Yuta Gosei for the title. Kono challenged Iyama for the Tengen title last November, but lost three straight; he will be hoping to improve on this record in what will be his first Gosei challenge. The title match starts on July 6. New Professional Couple: On June 4, Suzuki Ayumi 6-dan and Rin Kanketsu 7-dan got married at a hotel in Karuizawa. Rin commented: “There’s a perfect balance of supply and demand in our marriage: I like composing life-and-death problems and my wife likes solving them.” As far as I know, this is the 16th marriage among Nihon Ki-in professionals.